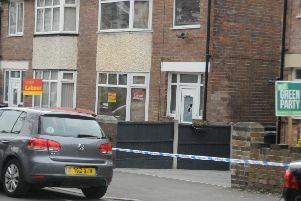 A road on a Sheffield estate is sealed off this morning after a boy, aged 16, was shot. Part of Manor Oaks Place, Wybourn, has been cordoned off, with motorists and pedestrians unable to enter the crime scene. The boy was shot at around 10.10pm when a motorbike pulled up next to the boy, followed by a red car. A passenger got out of the car and opened fire at the teenager - shooting him in his hand and thigh - before getting back into the vehicle, which drove off. The injured boy was taken to hospital, where he remains today in a stable condition. Detective Inspector Jamie Henderson said: "We are in the early stages of the investigation but we do believe that this was a targeted incident. Anyone with information should call South Yorkshire Police on 101 and quote incident 952 of September 13.